Praxis Core Study Guide - Do You Make This Mistake In Praxis Core Prep? If you’ve read through Praxis Core study guide reviews on Amazon.com or talked to others, you’ve heard the horror stories of failing the Praxis Core Academic Skills for Educators. Don’t take a chance you might fail any part of the test. Do you feel stressed just thinking about a timed test? Is this your second career so the last time you took a math class was years ago? Do selected response answers seem so similar that you choose the wrong answer? You are not alone. But you may need to have some help to pass the test! The Praxis Core study guides and Praxis Core practice tests you use make a big difference between pass or fail. But choosing the best Praxis Core study book is critically important. Follow these simple Praxis Core study rules to review the material and the types of questions you’ll face. You’ll soon be less stressed and more confident that you will pass the Praxis Core—the first time! As a teacher your job will be to give your students the resources they need to succeed. But many teachers fail the Praxis Core test because they don’t use the best resources available! Are you using all of the best Praxis Core study guide books> available so that you can pass? Find the free preparation resources offered by the Educational Testing Service (ETS) under “Preparation Materials” for Reading (5712); Writing (5722); and Mathematics (5732). Next, do what you would want students to do: skim the Table of Contents. Some information is repeated, but some sections apply only to Praxis Core Reading, Writing or Mathematics. Finally, take the time to read carefully the Praxis Core Sample Test Questions for each test. How are your skills? You’re now a more educated consumer of Praxis Core study guides. You’re now in a position to select the Praxis Core books that will provide the most direct path to a passing score in the least amount of time. Choose an effective Praxis Core practice test with this information. Many teacher candidates are surprised by the level of difficulty of questions asked on the Praxis Core exam. Although none of them are above middle school level, a review of the material is important. Does Your Praxis Core Study Guide Cover The Tested Material? 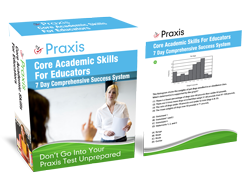 Be prepared for all three Praxis Core Academic Skills for Educators subtests. Do not underestimate the test content or the level of questions. Here is the basic information provided for each test. Does Your Book Give You Praxis Core Practice Test Questions? Because the Praxis Core is selected response, make sure your study guide gives you tips on choosing the best answer. Many candidates who failed complain that many of the answers are similar, so choosing the correct answer one is harder than they thought. If writing is your weak area, remember that the best Praxis Core test study guide will guide you through both selected response answers and constructed response (essay) answers. Moreover, it’ll provide proven constructed response formula to use. You should learn how Praxis Core constructed response answers are scored and see model answers so you can practice writing your responses. Most teacher blogs discussing Praxis Core study guides and test preparation state the mathematics is the most difficult for candidates. Whether you plan to teach kindergarten or third grade, remember that this Praxis Core math exam assesses your ability to do basic algebra, geometry and statistics and probability. If this is your weakest area, look for a Praxis study book that reviews the math concepts and formulas that are typical of this exam. But make certain the study guide for the Praxis Core goes one step further: look carefully at how information is explained, especially if it’s been a long time since you learned or used the math. Is the information explained clearly for you? Look closely at sample questions and how each of the correct and incorrect responses are explained. For many test-takers, learning why they choose the wrong answer can lead to correct answers! Be brave. Admit you don’t know everything! If you have honestly read the requirements for each test, you must have had questions about the contents. It can be embarrassing to admit you do not understand the required competencies measured on this assessment. However, it’s more embarrassing and stressful to fail! Find your areas of weakness. Then find a Praxis Core test study guide that addresses YOUR weaknesses based upon the Core test’s Contents. Spend the most time on those specific sections that confuse you. The Praxis Core tests have been given for years. That means there has been plenty of research done to help you pass the test! What do experts (real test-takers) say? Is it updated to match the current test? Check copyright dates: make sure it’s not just the date that’s changed! Check the actual material inside: does it match current test contents? Does the Praxis Core book explain answers in a way that you can understand? Look carefully at the sections you KNOW will be difficult for you. Is the Praxis Core prep guide error-free? Check pages for grammatical errors: they may signal errors in other places. Check reviews online: some typos may not make a difference, but if you are weak in mathematics and there are answer errors, it will lead to frustration, not help! The ETS will tell you “there are no trick questions.” And they are right—kind of. The Educational Testing Service gives some test-taking strategies, but a Praxis Core exam study guide should give you more strategies to understand the actual words and phrasing that may seem “tricky” to test-takers. Look at the Table of Contents of your Praxis Core study guides for strategies to read the questions and strategies to choose the correct answer. It will also be valuable to find strategies to recognize wrong answers. Using the best Praxis Core prep guide can mean passing the test and becoming a teacher, but only if you use it correctly! Don’t cram: instead, set up 20-40 minute periods over a series of days or even weeks to work through the study guide to master the information on the test. You will remember more of what you studied by using shorter periods than 2-3 hours at a time! The cost of each test is $90. If you take all three, the cost is $150. Even though it costs more to take the parts separately, ask yourself if that may be worth the $30. Taking the Praxis Core tests one at a time may give you valuable time to study for each section separately. Ask yourself, what will it really cost you if you fail the Praxis Core Exam? You want to teach. Make sure you pass the Praxis Core the first time. Using the best up-to-date Praxis Core study guide book will lead you to a career you will love!